The crowd in Chisamba views the awesome sight of a total solar eclipse. 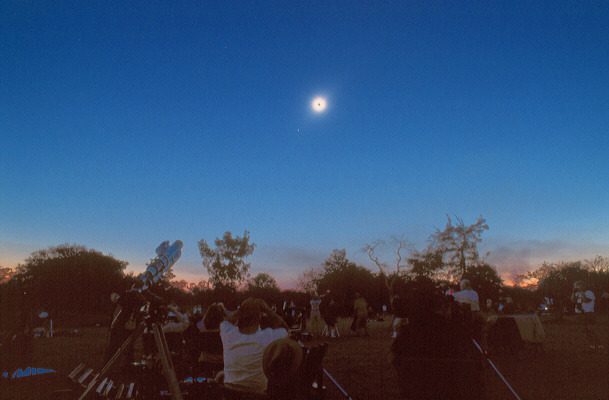 The dark blue sky and the orange glow on the horizon in this image approximate the visual appearance of the sky during totality. Jupiter is visible to the lower left of the eclipsed Sun. My Vixen 102-ED, which was used to take the other images of this eclipse, along with a 60mm guide scope on a Great Polaris mount, is visible in the left foreground. To the right of my telescopes, Steve Edberg, veteran of over a dozen total solar eclipses, views the eclipsed Sun through binoculars.